As I said yesterday, I’m observing the upcoming fifth anniversary of my retirement from The Star by looking back at a few of my favorite stories from the early years of my career in Kansas City. On Sunday, June 14, 1970, just nine months after I started at 18th and Grand, I had the opportunity to interview Janis Joplin, who was then near the peak of her powers. Turns out she was also addicted to heroin, which probably accounted for her high state of agitation on June 14 — and many other days, undoubtedly. She had been through a couple of bands, including the famous Big Brother and the Holding Company, and for the tour she had put a new one together called Full Tilt Boogie Band. Janis...on June 14, 1970, Kansas City, Kan. I was a huge Janis fan, and that summer’s tour included stops in Cincinnati and my hometown of Louisville, Ky., as well as Kansas City. In a couple of cities before hitting the Midwest, Janis had invited audiences to gather in front of the stage and dance. That led to at least a couple of shows being stopped temporarily. At every stop after that, security officers and arena officials were wary of disturbances and stood ready to suspend concerts in the interests of public safety. I took vacation time to attend the concerts in Cincinnati and Louisville. The Cincinnati concert was outdoors, and there were no problems. 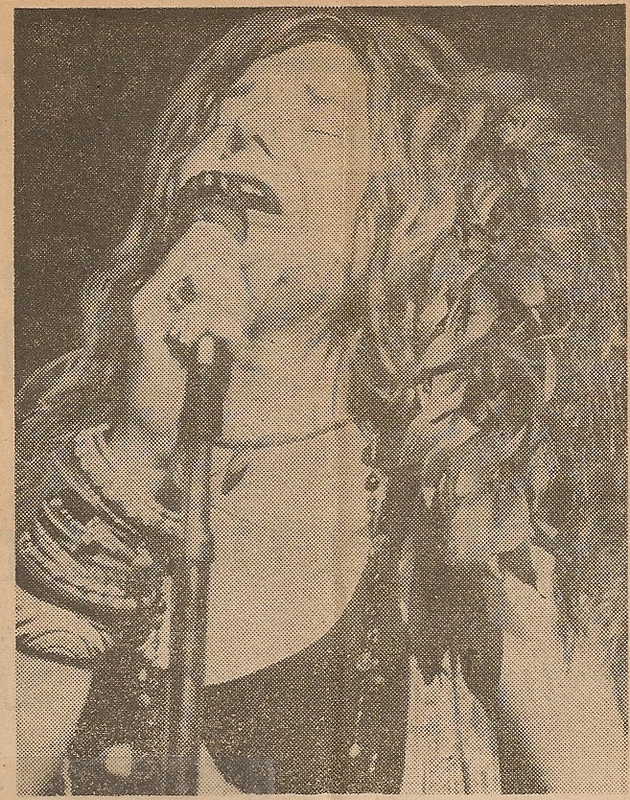 At Louisville’s Freedom Hall, however, Janis again incited the crowd, and as I recall, people rushed toward the stage. The lights came on quickly, and an announcement was made that if people didn’t get back in their seats, the concert would be over. When it was time for her Kansas City appearance — Memorial Hall in Kansas City, Kan., actually — I asked the city editor, Donald D. Jones, to let me cover her. He acquiesced, although I think he was dubious about what I would come up with. Two shows were scheduled that Sunday, one for about 6 p.m. and the other for 8. I spoke with a publicist or assistant before the first show and told her I’d like to talk with Janis. She said I could ask her for an interview when she arrived. Minutes later Janis, wearing violet-tinted glasses and a maxi-length, flowered skirt, burst through a back door of the auditorium, and after reaching her dressing room began stomping on the floor. The woman who haunts security police everywhere was preparing to rock-n-roll in two shows. Miss Joplin, noted for her shrieking style of singing and her occasional use of obscenities during performances, reappeared with violet and green ostrich feathers dangling from her hair and wearing a black outfit with bells jingling at the bottom of her crocheted pants. She glanced out at 1,200 persons awaiting her appearance for the 6 o”clock show and looked back at the musicians who accompany her. “This isn’t right,” she whined. “How can you rock-n-roll at 6 o’clock in the afternoon? I mean, man, you don’t even need lights out there, it’s God’s own light. She was announced. She sprang on the stage, twisted up her face and wailed into the microphone, “Whattya need? Whattya want?” Her fans yelled, clapped their hands to the band’s ear-splitting background rhythm and bobbed up and down in their seats. The show went smoothly — no off-color language and no dancing with members of the audience. She didn’t even invite the crowd to dance, a move which in the past has prompted security police to threaten to stop performances. At the end she was out of breath and the loose-fitting garment over her shoulders was wet with perspiration. When the crowd had left the 27-year-old singer sat in the stands sipping bourbon from a pint bottle. She dabbed at her face with a white towel hanging around her neck and said, yes, sometimes she could relax. She noted that it was a violation of her contract if she urged an audience to dance, and it only happens, she insisted, when it kind of slips out by mistake. Besides, she added, it is rarely a dangerous situation when her fans take to gyrating on their chairs or in front of the stage. Janis said she and her troupe were treated badly in hotels, bars, restaurants and just about everywhere else they go. Less than four months later, on Oct. 4, 1970, Full Tilt Boogie’s road manager, John Cooke, found Janis’ body in a room at the Landmark Motor Hotel in Hollywood Heights, Calif. She had been staying there since August. The official cause of death was an overdose of heroin, possibly combined with the effects of alcohol. Thanks, Chuck. I knew your expectations were high…Glad it measured up, in your eyes. I’ve told some people that if I had realized that my favorite story would come nine months into a nearly 37-year career at The Star, I would have gotten out then and done something else. Of course, that story helped whet my appetite for the business, and the entire body of work comprised a rich base from which I can draw now, in this, my reflective and analytical period. I’m glad to have made it to this stage! Wow that is too cool. Man, those were some crazy times.